NASA scientists have discovered evidence of past water movement throughout a Martian meteorite known as Yamato 000593. A team of scientists at NASA’s Johnson Space Center in Houston and the Jet Propulsion Laboratory in Pasadena, California, has found evidence of past water movement throughout a Martian meteorite, reviving debate in the scientific community over life on Mars. The team’s findings have been published in the February issue of the journal Astrobiology. The lead author, Lauren White, is based at the Jet Propulsion Laboratory. Co-authors are Gibson, Thomas-Keprta, Simon Clemett and McKay, all based at Johnson. McKay, who led the team that studied the ALH84001 meteorite, died a year ago. 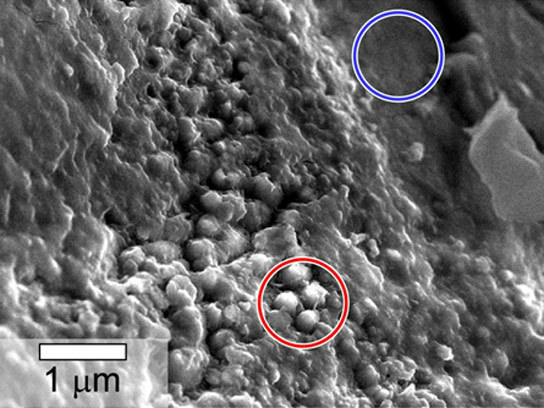 “The unique features displayed within the Martian meteorite Yamato 000593 are evidence of aqueous alterations as seen in the clay minerals and the presence of carbonaceous matter associated with the clay phases which show that Mars has been a very active body in its past,” said Gibson. “The planet is revealing the presence of an active water reservoir that may also have a significant carbon component. 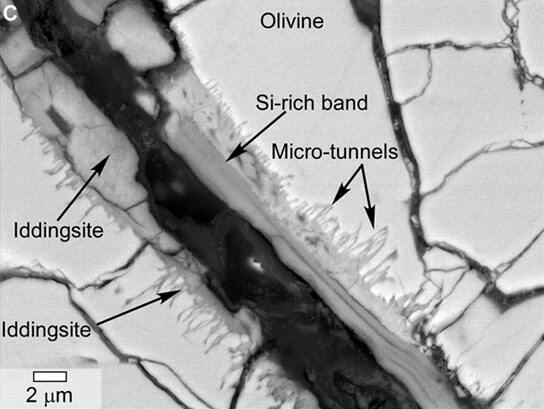 “The nature and distribution of Martian carbon is one of the major goals of the Mars Exploration Program. Since we have found indigenous carbon in several Mars meteorites, we cannot overstate the importance of having Martian samples available to study in earth-based laboratories. Furthermore, the small sizes of the carbonaceous features within the Yamato 000593 meteorite present major challenges to any analyses attempted by remote techniques on Mars,” Gibson added. 1 Comment on "Scientists Discover Evidence of Water in Martian Meteorite"
Interesting that this is entitled ‘Evidence of water’ whereas in fact it is actually about possible ‘Evidence of life’. The fact that there was water on Mars is very old news indeed. I can see why the authors want to be cautious after the response to the previous Mars meteorite life evidence announcement. It is a shame that real scientists (those who actually investigate observations that fit outside the expected rather than bury them) now appear afraid to openly admit to discovering anything original/contentious for fear of being ridiculed and ostracised. I wonder why they felt adverse to using the word ‘life’ rather than mask it using terms such as biotic, bio-alteration and biogenic. Although the possibility of abiotic action or terrestial contamination are given as alternative options it is not clear how likely these are. What if anything was done to avoid erroneously examining terrestial contamination and what particular abiotic actions could cause a result identical/similar to that seen ? Are these really viable alternatives to the overall conclusion that this and the previous mentioned Mars meteorite both indicate the existence of primitive micro-biological life on Mars being present sometime around 12 million years ago.